Five others joined me for this, again, strenuous set of day climbs. We had three days of a holiday weekend. 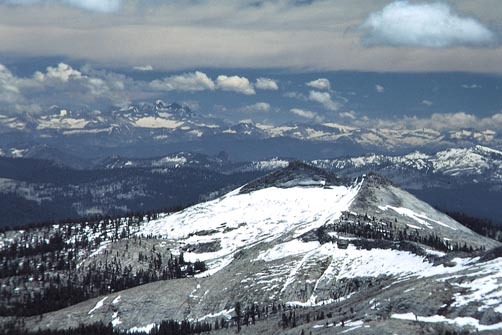 These were all peaks set on the western slope of the High Sierra, reached by a drive from Fresno, CA. Choosing not to do a backpack climb, I saw fit to take a few, largely snow-free, routes, for people less inclined to wear waterproofed boots and carry snow climbing equipment. Typically, with a heavy snow year, many Sierra vacations have to be canceled for those unwilling to deal with lots of snow. I have seen and heard of up to 15 feet of snow around the high road passes, even in mid-July! Saturday morning, we carpooled from a car camp, to search for the trailhead for Spanish Mountain. I took a wrong road, and was informed by horse packers that we were at the wrong place. Looking at the maps, which aren't always so accurate, I discerned my error, and then led us to the correct locale, the Crown Valley Trailhead. We started up the trail, then after a couple miles, had a shallow stream crossing. We had to wade. I worry about some of these, because of my camera gear. A dunk means functional loss, expensive repair, or even total loss. Navigation was the main difficulty on this climb. We came to Statum Meadow, and missed the trail junction, which is indistinct. I headed straight, cross-country, on an approximate compass bearing. Then we came to a 4WD road. Following it for a bit, we ran into snow, and lost the trail. We searched about, then took another bearing to head for the peak. I led us over a small rock ridge, then we had to drop down a bit. The others confidently led the short way to the top. I snapped photos of the register. One guidebook stated that the view south, into the Kings River Canyon here, is the largest vertical drop, 8,000 feet, in the western High Sierra. It was disappointing to some. There were no Yosemite style cliffs, but forests and chapparal all the way down in this classic V-shaped canyon. But, we had a nice view of the Obelisk to the east, which is a difficult rock climb. Some CMC groups have conquered this crag in the early 90's. Many flowers grew where there was bare ground. Some bigger white ones with yellow stamens poked out of the snow. We had seen a good number of snow plants, which are a beautiful red cluster of stalks up to a foot high. They tend to grow as the snow melts. I led us down off the peak. Our tracks had melted out, so I lost our route. Looking at the map, I saw that if we headed straight in one direction, we would come to a trail. We tromped over snow, through ancient forests, and across a small pond to maintain our heading. I began to worry. We were gobbling up time. My faith in trails shown on maps began to waver. We could have to spend the night out. Then, we found the trail. Lucky break! Following it back to Statum Meadow, we saw where and how we had missed it. The way back was assured. Although we arrived back to the vehicles at a late hour, we were now safely having dinner at our cars, and planning for our next day's climb. There was a bit of a drive, the next morning, to get to the trailhead for Three Sisters, near Courtwright Reservoir. But we knew this would be an easier peak. A flower show entertained us for much of this hike. The trail leads, in four or so miles, to Cliff Lake. Then it is a cross-country hike to the top. 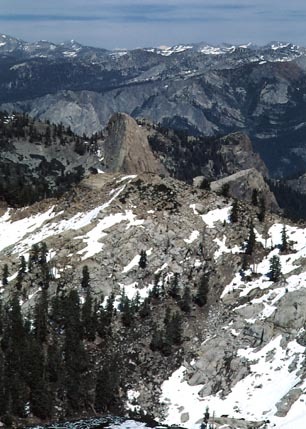 The view, set off from the rest of the High Sierra, was photographed. We dried out the papers in the register, as they had gotten damp somehow. It could be raining as climbers sign in, without their thought about molds and other spoilage happening. I placed a new book. On repeat climbs, I wonder how my placements sometimes disappear, with another book in place. The hike back was leisurely. We camped at a USFS campground near the trailhead. As typical this time of year, there were lots of mosquitoes. But, the beauty of the locale diminishes the annoyance. On our last day, only two chose to join me for Eagle Peak. It is not a listed peak, but seemed to be a worthy goal. Two hours of cross-country hiking led us to the summit. I placed a register. Taking more view photos, we enjoyed the success of a three-peak weekend, with an easy drive home ahead of us. The weather had been excellent, and the climbs safely done. I don't remember if we met for dinner somewhere on the way home, but I was home at a decent hour. Due to the typically strenuous nature, with skill requirements, of the Climbing-Knapsack Section activities, I suppose most people will avoid us. But then, a good mountaineer is one in a million. It is fortunate to have such great company.